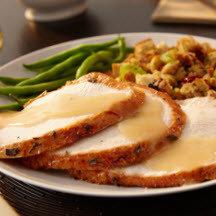 Brining naturally adds flavor and moisture to roasted turkey. The proof is in the tasting — one bite and you'll never go back to roasting a whole turkey without first brining it! Prepare the Savory Brine: Mix water with remaining ingredients until all the salt is dissolved. Place turkey in brining bag or container, breast side down. Add brine recipe. Seal and/or cover and refrigerate overnight or at least 8 hours. Remove turkey from the brine, rinse well. Follow package directions for roasting turkey.